Ride 5 days in Kananaskis Country and finish with a ride in Writing-On-Stone Provincial Park, Southern Alberta. It is the perfect combination for all those who can't decide whether to enjoy the quiet wilderness of the Canadian Rockies or gallop across the Prairies and through the badlands of Southern Alberta. A wilderness getaway into the breathtaking mountain wilderness of the Kananaskis range - in the foothills of the Canadian Rocky Mountains – then you are off to the wide open plains for the prairies. This is a rugged, minimum impact wilderness adventure, in small groups where everyone can get personal attention and develop their abilities and confidence. The first five days in the mountains give you lots of time to develop an affection and appreciation for both your horse and the Canadian wilderness, though almost everyone agrees that the time flies quickly and they are left with the urge to return and explore other untracked valleys and ridgelines. After a short overnight rest at the B&B we are then off to ride across the open windswept plains of Southern Alberta. It is excellent riding country, with unlimited opportunity for experienced riders to move at a faster pace. This is not are not a big "corporate" ranch or pack outfitter. Indeed "big" is incompatible with our desire to leave as small as possible a footprint on the wilderness. We don't offer opulent luxury with simulated but tightly scripted "adventure". We don't stage mock gun-fights or hold-ups for the amusement of "tourists". This is a genuine, real-life adventure, breathtaking scenery, camaraderie of the trail, excellent camp-fire cooked food and the opportunity to learn as much as you can about horses, riding and living with nature. The "Rattlesnake Round-up" is just a name chosen for a competitive trail ride conducted at Writing On Stone Provincial Park, in Southern Alberta. They call it that simply because it is the one part of the province that has rattlesnakes, although they aren't so numerous that a sighting is guaranteed. In Alberta Competitive Trail rides are sanctioned by TRAC. There is an explanation of sport on their website http://www.trailriding.ca . The competition is very friendly and low-key, people are just trying to get the best performance from their horse. It is likely that we will enter you in the "novice" category, which is roughly 35-40 kms to be completed in 5 and a half hours. We will ride as a group, so even though we are scored individually, one of us will set the pace and coach as we go. We depart Bragg Creek on Friday before noon, drive 375 kms to Writing On Stone, set up camp and vet the horses in for the ride that evening. The competition ride itself is on Saturday. There is a big party Saturday night, and on Sunday the awards are presented and then we will ride some of the route again at a leisurely pace to pick up the trip markers and take some photos of a very interesting landscape. Then we drive home that afternoon, arriving back in Bragg Creek Sunday evening. The competition has an entry fee (normally around $65-75/horse), and all participants must be members of the Alberta Equestrian Federation (AEF). This is already included in the tour package cost. If someone isn't keen to do this part of the program, we are happy to have them just do the Kananaskis Explorer Ride. It is an unforgettable experience! If the Rattlesnake Round-up is cancelled for some reason, we will discuss other fun riding options for the last 3 days of this program. This vacation is for riders with moderate or better experience and a keen sense of adventures. Four to seven hours per day will be spent on trail, though people wishing to spend a day or two doing other activities such as hiking or relaxing will have that option. The horses have been chosen for their endurance, spirit, and sure-footedness in the mountains. Since the pack train uses different trails we will often canter where the trail is suitable. The guests are expected to help in tending to the horses and other camp duties. Most horses will be fitted with western style saddles but those with a distinct preference for English riding may be accommodated. This trip is designed for keen riders who are up to the challenge. There are some trails we use where it is necessary to hike over rocky terrain, either to avoid undue risk or to enjoy a vista that cannot be ridden to. For most people this is a refreshing change that allows them to stretch their legs. We recommend that you bring or wear comfortable footwear that you can hike for a kilometer or two in. On day 1 you will receive a Duffle bag with a warm sleeping bag and mat. All you personal gear will have to go into this duffle bag including mat and sleeping bag. * If you have any medical condition like allergies, or are on medication, please tell your guide. Because everything must be loaded on pack-horses, guests must pack their gear in 1 standard sized duffel bag, weighing no more than 25 lbs (11 kg) - not including what you wear and carry on your saddle horse. Your trail horse will have 2 saddlebags tied to the saddle. One is for your personal items to carry on the trail, such as camera, sun protection, water bottle, extra layer of clothes, etc. The other bag is reserved for "group items" such as lunch or first aid kit. Your rain wear will also travel with you tied behind the saddle. This is a pack trip so nights will be spent at different campsites. You will spend a total of 3 nights at the ranch, and the remaining 7 nights will be spent camping in 3 different campsites. 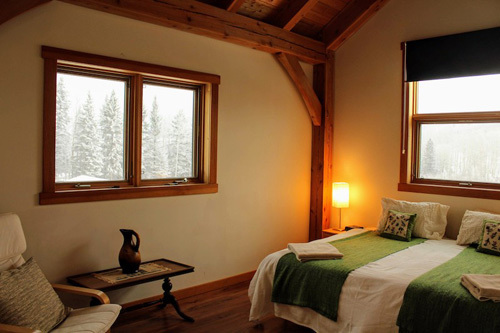 The ranch lies in the foothills of the Rocky Mountains, 13km south of the picturesque hamlet of Bragg Creek and roughly 60 kilometers southwest of Calgary - a wilderness area stretching to the Continental Divide! Landscape changes from one of rolling ridges and open forests to one of high alpine meadows, thick primal forests, and shear limestone cliffs. The heart of the guest quarters is a large, bright communal space where we socialize, eat, cook, listen to stories or just enjoy the view over the horse pasture. The guesthouse has 5 rooms (2 single rooms with one double bed, and 3 rooms with king bed, two twins, or two double beds). There are 2 full bathrooms, which are shared amongst all guests. We provide all bed linen and towels, but please bring your own soap and shampoo. There is a hairdryer in each bathroom. We have an outdoor fireplace with picnic area. Smoking is prohibited anywhere on the property except for around the outdoor fire pit. There is no TV in the guest house, but there is complimentary WIFI. You are welcome use the i-pod docking station, boards games, and a large selection of books and magazines available. Laundry is available for an additional fee at certain times of the day. On the trail we stay in simple but comfortable camps, their locations are well chosen within the given geography. We will be utilizing 3 different campsites. 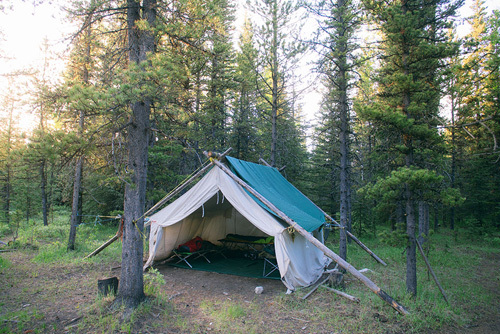 We sleep in large wall tents on cots, which are big enough for 6 people. Most camps have several tents so the group can split up if necessary. Sleeping bags and mats are provided. We always camp within easy walking distance of a clear stream or river where you can swim or wash yourself. Bathroom facilities are pit latrines dug in each camp a short walk from the tenting area. They aren’t quite out-houses (only tarps for walls), but they have toilet seats. There is no electricity in camp, we recommend power bars or solar chargers. The single supplement fee will be waived if you are willing to share. Note we don't normally offer private tents unless people want to bring their own. Space on the packhorses is limited. All meals are included from dinner on Day 1 to breakfast on the last day. At the Lodge: Full breakfast and dinner, prepared with local and fresh ingredients. Breakfast is typically served around 8.30 AM, dinner around 6.30 PM. 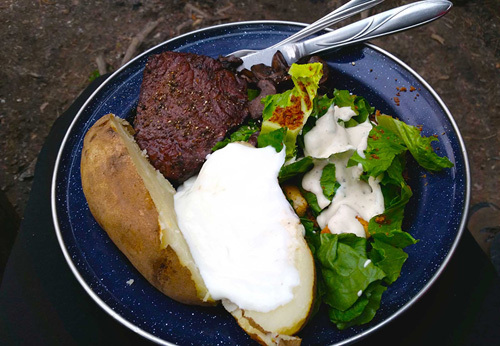 In camp: all meals are cooked over an open campfire and prepared with fresh ingredients. The menu changes daily. The menu changes daily and offers typical local dishes but also internationally inspired cuisine. Ingredients include locally raised organic beef and pork, fresh vegetables and fruits. Breakfast is typically hot and dinner is typically a main course with a salad and dessert. Lunch is picnic-style with sandwiches or wraps, fruit and granola bars. Coffee, teas, water, juice for breakfast, and hot chocolate are complimentary while you stay with us. Please note that we do not serve alcohol, but feel free to bring your own as well as any other favourite drink you like. We cater to most dietary restrictions with prior notice. Gluten-free requests are $10 extra per day.